1. SK-II Facial Treatment Mask - Big time splurge, but big time results. This is definitely a special occasion mask for me. I used it before going to a wedding because I wanted an extra boost of hydration and radiance - and boy did I get it. Wow! I applied it an hour or so before I put on my makeup, left it on for 15 minutes, removed and pressed the remaining essence into my face. It was like an instant facial, and my makeup applied like never before. For a true pampering experience, this is a must have in your skincare arsenal. 2. Amore Pacific Moisture Bound Sleeping Recovery Mask - After having such a great experience with the other two sleeping masks I been have using (this one and this one), I was happy to add a true hydrating one to the mix. The Amore Pacific Sleeping Recovery Mask has a cooling gel-like feeling when applied and a little goes a long way. It does take a few more minutes than my other sleeping masks to dry down, but nothing that is unreasonable. The first thing I noticed the next morning was how plump my skin appeared and it was as if I had been drinking the recommended 8 glasses of water a day for my entire life (which sadly I do not all the time). There was not a dry spot in sight and barely any sleep lines, which I always get because I sleep on my stomach or side. Great to use once a week or more if needed. 3. Arcona Wine Hydrating Mask - I always expect a thin, watery gel-like consistency when I use hydrating masks. And this Arcona hydrating mask served to break me of that misconception and stereotype. As soon as I squeezed some out of the tube, the thick rich cream texture told me that it would be different than other hydrating masks I have tried in the past. Instead of being solely for moisture renewal, I found this mask to be great at nourishing, calming and replenishing my skin. With ingredients like shea butter, hyaluronic acid and grapeseed extract, it's no wonder the results were so substantial. 4. 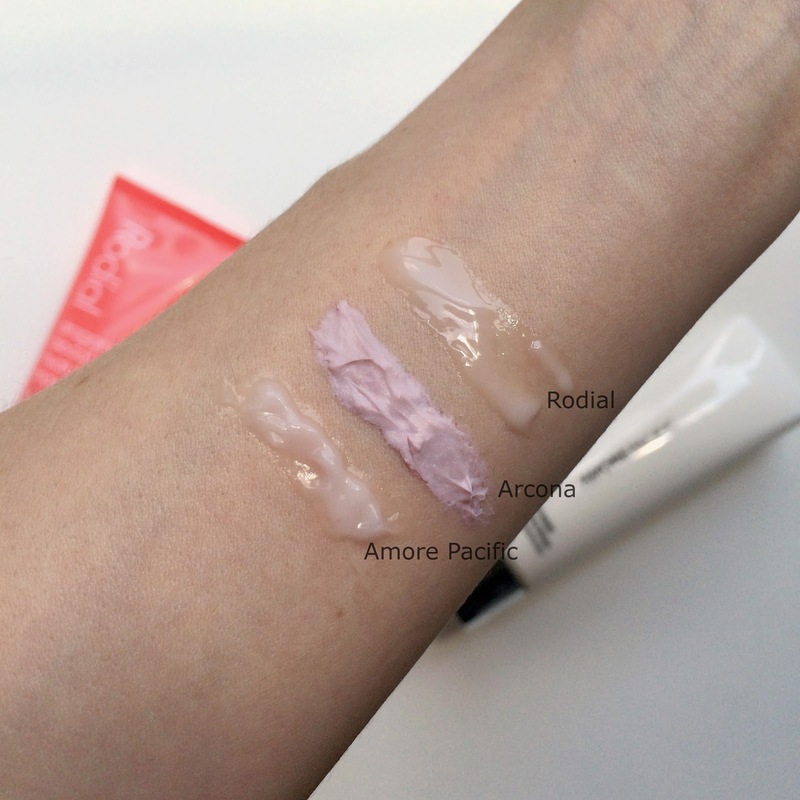 Rodial Dragon's Blood Hyaluronic Mask - The Arcona mask may have thrown me for a texture loop, but this Rodial Dragon's Blood Hyaluronic Mask brought back the expected hydration mask texture I have come to know and love. A gel-like consistency that feels refreshing from the moment it is first applied. I don't typically like masks in the morning because I am running around like a chicken with my head cut off trying to get ready, but I have been applying this after I wash my face and before I step into the shower. I don't know if it's the shower intensifying the moisturizing properties, but my skin feels glorious when I rinse the mask off. I have even skipped my usual morning serum combo (this and this), in favor of just adding some SPF and applying my makeup straight away. It feels like a new secret I just discovered and I am loving the way my makeup looks after using this. I can't say this new addition makes me any more of a morning person (I wish I was), but at least my skin can fake it, right? Have you tried any of these masks? What are your thoughts? Do you have a favorite hydrating mask? Leave me a comment below!